Canadian governments and courts recognize that pre-contact Aboriginal societies possessed their own legal and political systems, and that to this day these nations have not surrendered the powers they fully exercised before colonial policies undercut their authority. Unfortunately, however, the governments of Canada argue that it is not clear what this means — that is, what contemporary Aboriginal self-government rights look like. From 1983 to 1992 there were concerted efforts to constitutionally entrench Aboriginal rights to self-government. With the failure of these efforts considerable attention has turned to what courts might say about these rights, and to how they might be achieved through negotiations. As Aboriginal nations litigate and negotiate, pushing back against the history of colonial policies and practices, the challenge is to develop strategies to ensure that self-government rights develop within the Canadian state as fully as possible. Christie, Gordon. 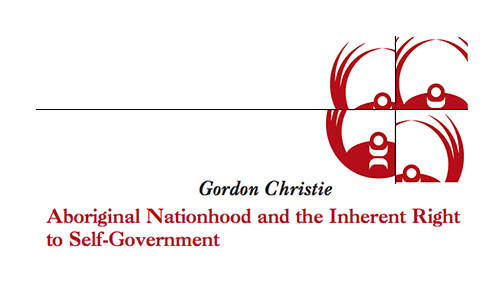 "Aboriginal Nationhood and the Inherent Right to Self-Government". Research Paper for the Centre for the National Centre for First Nations Governance. The National Centre for First Nations Governance. Canada. May 2007. Paper.